This bench is located on the Snowmass Mall near the Fanny Hill run. Emmy Lou Badger owned and operated several different retail shops in the Snowmass Mall. She moved to the Roaring Fork Valley from Denver the very first summer that Snowmass opened. She always sat on the bench outside her gallery and everyone would stop, sit, and talk with her. She moved to Green Valley, Arizona in 1990 and died there in 1998. Thanks to Mindy Badger Trovarelli for her help with the information on this page. Photos of the bench are below. 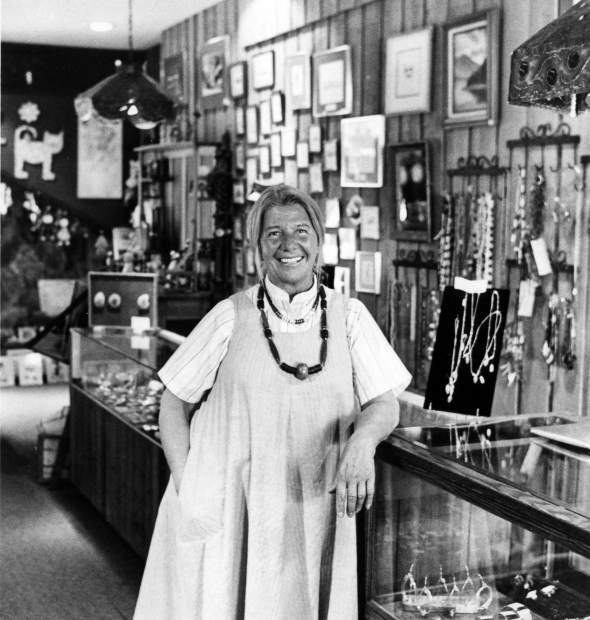 Emma Lou Badger poses inside her shop, La Maison d’Art, along the Snowmass Village Mall circa 1977. "The Life of Snowmass is in the mall shops," Mary Eshbaugh Hayes wrote in an Aspen Times article Aug. 18, 1977. "It started as a ski resort in 1967, built entirely new, and now it is 10 years and some 700 permanent residents later. … Towns used to grow along a Main Street. Merchants opened small shops and stores, hardwares and saloons. A lot of the residents are merchants in Snowmass. As in small towns everywhere, they set up shop because their services are needed. Because people want to buy what they have to sell. They can be seen out sweeping their sidewalks in the early morning. They have lunch together in the outside restaurants at noon, along the mall that is the Main Street of Snowmass Village. The shopkeepers have definite ideas about their town. Emmy Lou Badger is a partner with Francie McMahon in La Maison d'Art. She says 'I love Aspen dearly, I began skiing there 25 years ago. But when Snowmass first opened, I saw the great potential. I went to work in a shop called Flavia and moved right up here from Denver. I live in a condominium. I have five children and I thought what a neat place Snowmass would be to live and how great it would be for the kids. I don't regret it a minute. Over 700 locals live here now and it's like one big beautiful family. Once the season is over, there are so many parties.'"